1940-49 U.S. National Christmas Seals, Sheet Collection, full gum, F, MNH. Issued each year at Christmas by the National Tuberculosis Association (NTA). Dealer stock, not from a collection. Pristine, full brilliant colors, full gum, shipped flat. 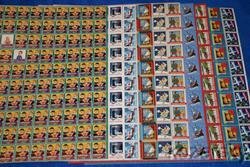 1940-49 U.S. National Christmas Seals, Sheet Collection, full gum, F, MNH. Issued each year at Christmas by the National Tuberculosis Association (NTA). There are ten (10) full sheets - one (1) for each year: 1940, 1941, 1942, 1943, 1944, 1945, 1946, 1947, 1948, and 1949. This is an excellent and economical way to begin or enlarge a TB Charity Seal sheet collection.